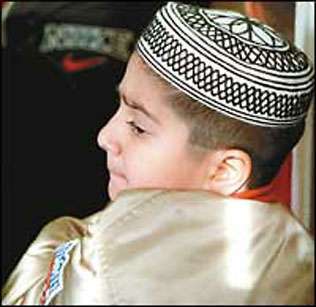 Unstable modern character and luxurious life have greatly affected our Muslim children. Thus, instilling strength, honor and responsibility in their personality is a serious problems in raising children. This task may require a great deal of patience and wisdom. Some Islamic solutions to this problem are listed below with the intent to aid the Muslim parents in the upbringing of their children in an Islamic environment. Takniyyah: Using the kunya or patronymics in addressing children. Takniyah is to entitle or call a young boy "Abu Foolaan" ("Father of so-and-so) or a young girl "Umm Foolaan" ("Mother of so-and-so"). Giving Kunyas will cause the child feel more responsible - develop maturity and feel above normal childishness. Taking children to mature gatherings and letting them sit with grown-ups. This will increase their understanding and wisdom. They will try to imitate the adults and spend less time on games and entertainment. This will encourage the child to be brave and be courageous, which is an important aspect of he Muslim's strong and honorable character. Al-Zubayr ibn al-'Awwam (radhi allahu anhu) had two children, one of whom was present at some of the battles, and the other used to play with the old battle scars on his father's shoulder. This was reported by 'Urwah ibn al-Zubayr, who said that the Companions of the Messenger of Allah (sallallahu alaihi wa-sallam) said to al-Zubayr on the day of Yarmook: "Will you go and attack, and we will go with you?" He said: "If I attacked, you would be lying." They said, "No, we will do (as we promised)." So he launched an attack (against the Romans), penetrating their ranks and passing straight through, but no one was with him. Then he turned around and came back, and the Romans seized the reins of his horse and wounded him twice in the shoulder. Between these two new wounds was a scar from a wound he had received at Badr. 'Urwah said, "When I was little, I used to play by putting my fingers in those scars." 'Urwah said, "'Abdullaah ibn al-Zubayr was with him on that day. He was ten years old. He (al-Zubayr) put him on a horse and entrusted him to the care of another man." Commenting on this hadeeth, Ibn Hajr (rahimahullah) said: "Az-Zubayr felt that his son 'Abdullaah was brave and chivalrous, so he put him on a horse, but he feared that he might attempt to do more than he was able, so he put another man with him so that he could feel that he was safe from the attacks of the Romans..."
Teaching good manners - Children should be taught good manners and morals from early childhood as mentioned in the Qur'aan and the Ahaadeeth of Allah's Messenger (sallallahu alaihi wa-sallam). For example, the manners of conduct in public, speaking in public, walking on the road, greeting etc. Teaching manly sports - such as archery, swimming and horse riding. Avoid humiliating them - especially in front of others. Never belittle their ideas, and encourage them to take part in Islamic activities. Clothe them in a modest way and protect them from inappropriate clothing (like silk clothes for boys and preserve the Islamic dress code for girls), hairstyles and movements. Avoid extravagance, luxury, laziness and idleness. Umar (radhi allahu anhu) said: "Get used to a rough life, for luxury does not last forever." Avoid entertainment and pastime gatherings, singing, music and other such activities that result in wastage of time and efforts, because these go against strength, honor and sincerity.